No teeth are perfect, and none of them last forever. Whether through accident, injury, or simply the wear of age, tooth damage of some sort or another will happen to millions of people. Sometimes that damage occurs in the form of multiple tooth loss. When you need to replace one or more of your natural teeth, the thought of dentures may be a horrifying one. Nobody wants to look like the comic gag of an old cartoon. There’s great news on that front! Dentures have come a very long way in a very short time. With the advent of digital technology, including CAD software and high-definition cameras, we can make dentures that fit, that stay put, and that look amazing. In fact, dentures may just be the perfect solution for your situation. Even aside from allowing you to once again have fully-functioning teeth, dentures can offer quite a lot. For one thing, partial dentures can stop the rest of your natural teeth from drifting or loosening due to bone loss and gum recession. They return your bite to its ideal function and comfort. These days, dentures can even come in both permanent and removable form. 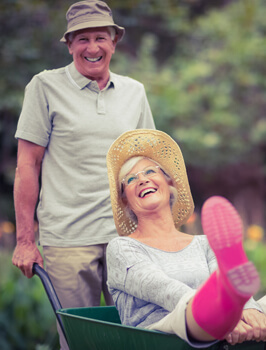 Implant-supported dentures are a spectacular way to get a complete set of permanent replacement teeth without all of the hassle of thirty-two individual implant procedures. A complete denture replaces all of your teeth in a full dental arch. We may suggest a complete denture to replace all teeth in both arches or just one, depending on your individual needs. During your consultation, Dr. Elrod will thoroughly explain each option and discuss with you which denture is best for you. This will all be based on your oral health history and your unique needs. No matter which solution we suggest, our dentures are always custom made to fit your smile comfortably, aesthetically, and securely.